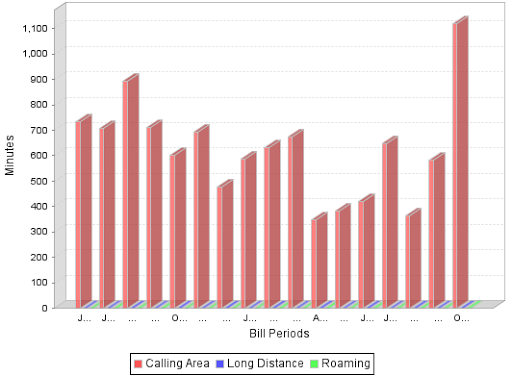 I received my cell phone bill from AT&T today and noticed that there are usage reports on the site. I typically don't look at these because I really don't care about my usage, but for some reason I decided to look at them. Icky, icky! Where are the dates? I can't tell the difference between some of the bars. Why are long distance and roaming included? You'd never be able to see them anyway. 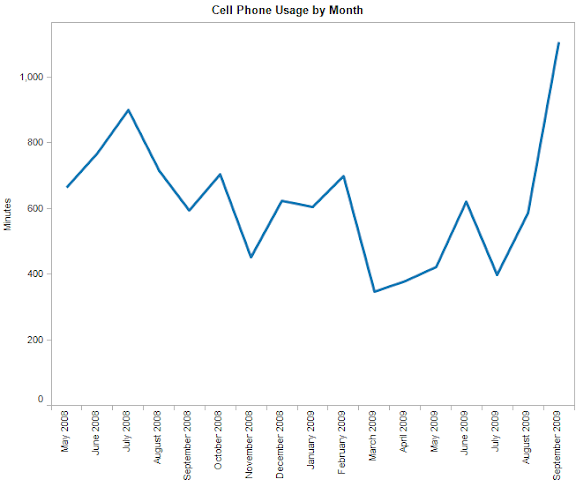 Why not use a simple line graph? Come on AT&T, get your act together. Although I suspect these were created by a developer that only knows how to use the default graphs in Excel and thought "Oh, I can make these so pretty with the 3D bar charts." Why the big spike in September? Conference calls...boooooo! There dreaded 3D chart. The line on time series shows the trend much more clearly.